When Dolce and Gabbana released a racist Chinese ad, it was just the latest in a long line of marketing gone wrong when it comes to the fashion world. 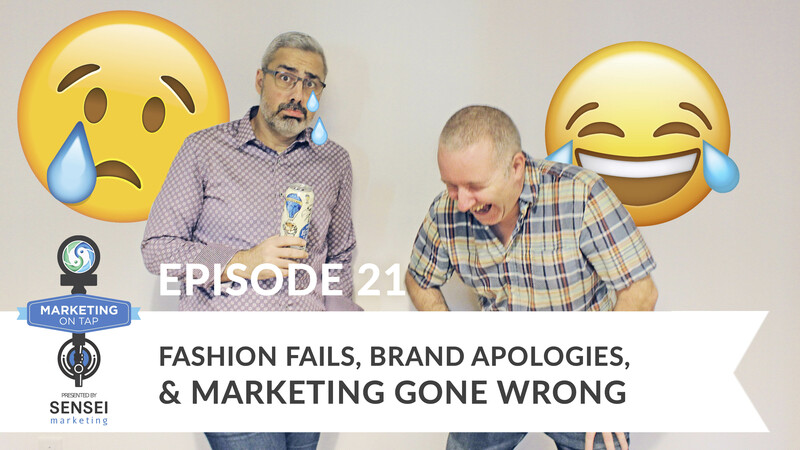 From LuluLemon saying their customers were too big for their products, to Topman describing their customers as football hooligans and criminals, it seems the fashion world is a leader of marketing gone wrong. 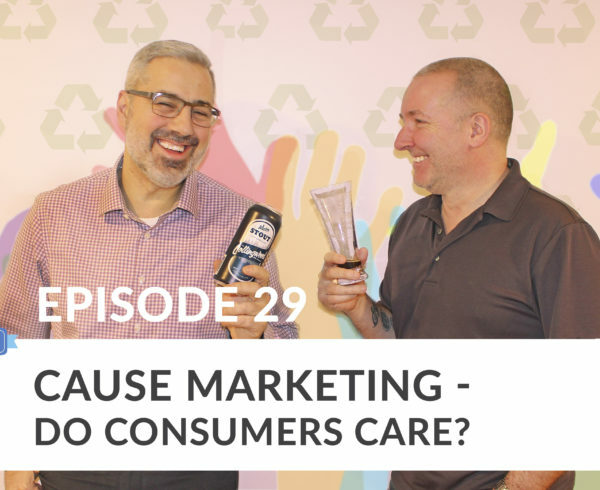 In this week’s episode of Marketing on Tap, we look at how brands can completely miss the message when it comes to their buyers, and how they often make it worse when coming out with an apology. Intro: Join marketers, authors and craft beer enthusiasts, Sam Fiorella and Danny Brown for a hoppy discussion on all things digital over a cheeky pint or two. Topics on the menu include influence marketing, social media, brand advocacy and a taste estate of real-world digital marketing campaigns. Some are smooth, others don’t sit so well. Don’t forget to stick around for last call where the boys will serve you up one final marketing take-away that you can go out and apply in the real-world. It’s a great primer before the weekend. 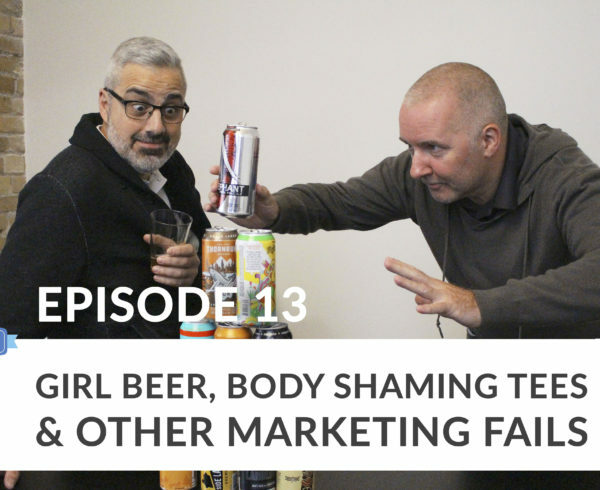 Sam: Everybody, welcome back to another episode of Marketing On Tap, otherwise known as Sam and Danny’s reason to drink during the workday. Sam: Today we are coming to you from our brand new offices. Sam: We just moved into a WeWork facility that’s getting a lot of attention. They’re opening up all over the world so our group is growing. We have..
Sam: Yeah, and we do have a lot more beer drinkers. So we’ve got quite a bit on the go right now. We needed a bigger space so we’re experimenting with new offices here today we’re hoping that the audio is going to be good here. And it’s also why we’ve got these, in honour of WeWork, we’re drinking uncharacteristically beer out of plastic WeWork glasses. Sam: With those small cups? Yeah, no, it’s slightly better than, ah, you know what, no, I think the solo cups are better. Danny: I don’t know, we should check that. Sam: OH, but they got beer on tap so it can’t be. Sam: Okay, never mind we’re good. Sam: So today we want to talk to you about fashion faux-pas. 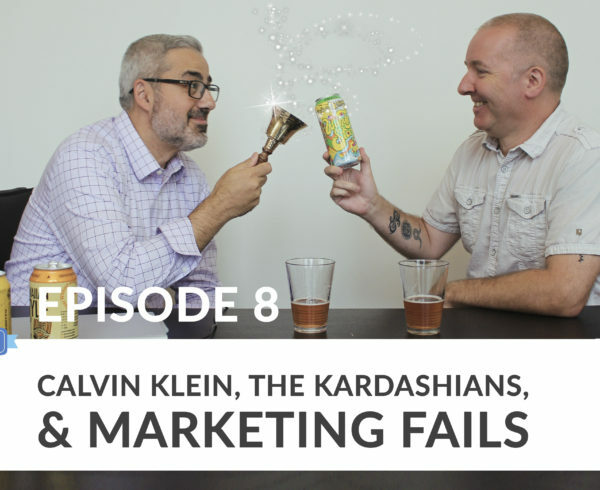 Danny and I, one of our favourite topics is marketing screw-ups. How other marketers have really screwed up their campaigns cause that’s just a fun thing to do. Sam: So today we found a number of faux-pas, marketing faux-pas, that are just one of those palm, what is it? Palm..
Danny: Palm in the head. Forehead. Sam: Yeah. They’re just really unbelievable, you know, how they can actually make it to market. And they all happen to be in the fashion industry so we have a fashion related, that’s why I’m wearing my purple flower shirt today. We have a fashion related episode with brands like Lululemon, Dolce & Gabbana, the Gap, and a few others. So that’s what we’re going to be talking about today, marketing faux-pas in the fashion industry. Sam: But before we do so, we have something interesting. Danny: So pass this over to Anna who’s our standby producer today. Sam: Yeah, Anna you wanna maybe. I want to get Anna because we normally have a Robert camera. You want to pass me. I want to get Anna on camera this time. We started something last..
Danny: Couple of weeks back. Sam: Couple of weeks back that we have a Robert cam because he’s not a big fan of craft beer and I just love watching his look on his face when he tries some of the beers that we have. Danny: So this one, again, we’ve friends up in Nova Scotia region started city brewing, awesome brewer and makes fantastic IPAs, Stouts and seasonals. And this seasonal is their maple butter tart which has got aromas of maple, because it’s maple tart and butter rum pudding, vanilla and caramel candy and that leads back into like a pie crust and a toffee flavour. So this is kinda like a, almost like a dessert in a plastic cup so we’ll have better glasses for next week when we’ll see..
Danny: Well let’s see what it’s like. It’s a 5% ABV so it’s a pretty easy going stuff. Sam: Well it smells pretty, we’ll see how it tastes. Danny: It smells like my granny’s pudding. Sam: Oh hi Anna. I want to have the Anna cam. Good? Sam: Anna seems to be a fan. Danny: It’s different, yeah I can get the fruit like a fruit pudding, almost like a Christmas pudding with a fruitiness going through it. Sam: Yeah, and a Christmas pudding is not a popular item so I’m not quite sure how this beer is going to do but I guess again for this time of the year I would have the one can. I don’t think I could have this on an ongoing basis. Danny: Yeah, it may grow on us on the way though. We’ll see. Sam: Well, it’s got alcohol so.. let’s be honest. Sam: Alright so let’s get back to fashion faux-pas. Danny, the first one I want to talk about is I guess the one that’s hot right now, the one that everybody is talking about today and that’s Dolce & Gabbana. An Italian designer, well a duo. Sam: Duo of Italian designers. They got into hot water after releasing a pretty racist ad that I don’t think they realized was racist. I don’t know what their marketing company was thinking. Sam: But it’s for their Asian market and they basically have a very attractive Asian woman in one of their outfits decked out with the jewelry, trying to eat pizza with chopsticks. Sam: And she was directed to do so in a way that basically fumbling with the chopsticks, like how do I eat this pizza with chopsticks? And she came across as a little clueless, which reinforces a lot of the stereotypes of, especially in Europe where Asians are socially maybe not all there. They don’t really know how to, you know, how to integrate with other cultures, so on and so forth. Sam: So it really perpetuated a stereotype that was going. And of course that got.. everybody up in arms. So again, we’re going to talk a little bit about the apology. So maybe let me through that in there as well. Sam: So they did apologize, so we’ll skip ahead. Backlash on social media is something we’ve talked about on this show many times. But if you watch the apology, and I think this is maybe almost more the story here than the actual faux pas of this ad. It’s the two designers, much like we are right now with this of course Baroque wall paper behind dark, reading an apology that essentially sounds like this. Sam: And there was no emotion in it, there was nothing heart felt and the apology almost made the whole thing worse. Sam: So, why does this keep happening? 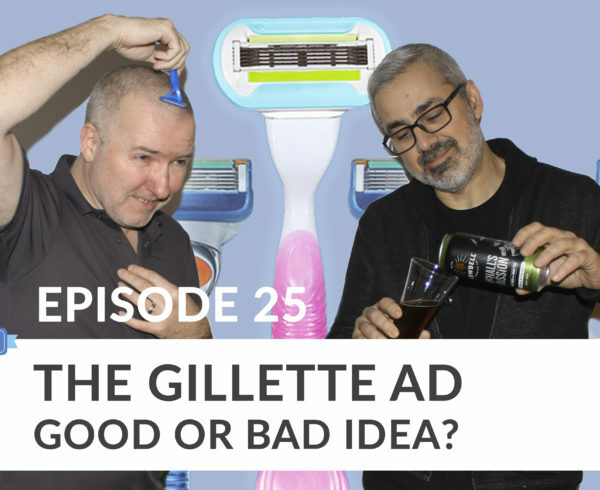 Danny: I think it’s a mixture of tone deaf we’ve spoken before about tone deaf brands and brands really don’t get when they screw up how they screwed up. Maybe a little bit of arrogance, I mean designers tend to be very egotistical because of their character and their entrance to the room. So maybe a little bit of arrogance and possibly they thought, well everybody’s overreacting and it’s very PC led world now, you know. Sam: Well, it’s coming through. Like their attitude is I don’t want to do this. There’s a PR company forcing me to do this. Danny: Right, exactly. So, they would have been better off not doing a visual apology and just put a press release out with a statement saying okay, we screwed up. You know, we didn’t intend to make a stereotypical, racist inference about this particular ad or this particular campaign. Sam: And this wasn’t my intention but let’s talk about apology videos here. Because I think this is, whether do you apologize or do you not apologize? And in a situation like this, given that these guys have been in hot water for you know, controversial topics more than once. How important is it for a brand to come out and apologize and how deep does that apology have to be? Like to what level do they have to go and make an apology? Danny: Yeah, well look back, I think we spoke about a couple weeks or a couple of shows back about the Domino’s Pizza CEO when he came out and made the apology because of his employees that were tampering with people’s food, etc. And since then, they’ve outstripped Google when it comes to substantial revenue growth and profits. So it shows that when done properly, the apologies do have an impact. Danny: With these guys, I’m not so sure because they have a very dedicated audience and I’m guessing how many of their buyers of Dolce & Gabbana wearers, etc, how many would actually stop buying them because of what’s happened here. Wouldn’t even see the apology, they’re just interested in how they look. I mean I could be making up broad assumption. Sam: Well, I think that’s a good point. And I like that the example that they went out of their way not just to apologize and again, it was from the CEOs, they’re from the top-down which I think is important. But they took a lot of action, it’s almost like an employee, you know, review. Like this is what’s wrong, here’s how we’re going to work to fix it, and let’s work together and then let’s do a progress report after so many days or months or whatever. Sam: And I think that’s what he did, he took that approach and said, we’re going to change it, we’re change our menus, we’re going to change our pizza, we’re going to change our delivery process, we’re going to change our HR. Sam: He went through this entire corporate restructuring because of this bad you know, social media and it worked. But he went beyond just an apology, he says, this is our action plan and this is what we’re going to do. Sam: I think another example is Starbucks. Not that long ago, remember this story? This just came to me now. What was the story of Starbucks when there was a couple of African Americans walked into a Starbucks and they were racially profiled in some way. I forget the details..
Danny: Yeah, they were asked to leave. Sam: Because they were loitering. Danny: That’s right, and someone called the cops on them. And the manager never really stood up for them and had to go and retrain. They closed Starbucks down for a day in the US. Sam: Well and I think from an apology standpoint, not only did Starbucks stand up and say, hey this is not our culture, you know, and clearly we need to better educate our staff. And they closed all Starbucks across North America for a couple of hours. Which I thought was brilliant. Sam: What kind of a better visual symbol to put your money where your mouth is. Sam: We’re closing all of our stores and we’re going to do cultural sensitivity training to all of our employees at the same time. Not only did it cost them a lot of money to organize that, they lost revenue. Sam: You know, all Starbucks across North America closed for so many hours in one day, can you imagine the millions that that would cost them in lost revenue? But eventually didn’t end up hurting their rent, because they took serious action beyond just an apology. Sam: But then you’ve got some that really don’t give up, bleep, and are just going to go forward anyway. Sam: Lululemon is a famous one here. Sam: It’s a Canadian brand, it’s this crazy yoga pant culture and Lululemon is one of the, I guess, leaders in yoga wear in Canada now around the world. They’re very famous and they became even more famous for the owner, Chip Wilson, was listening to a lot complaints online about women were complaining about the material of their yoga pants was too thin. And so they were tearing and you know, you could see skin through them because they were stretched out so much. Sam: So his comment to everybody wasn’t, oh we’ll take a look at that, or whatever we’re going to look at different sizes, we’re going to look at different fabrics. Bringing the customer in potentially and making a..
Sam: Yeah, crowdsourcing, like how can we make this better? Maybe they’re not going to change anything but at least publicly they’re going to say we accept your feedback and we’re going to work with it. Sam: What he ended up saying is well, essentially, I’m paraphrasing, but you’re probably too fat to be wearing yoga pants anyway. Sam: So the point was is that the reason they’re so thin is because your legs are too big and you’re stretching it out so much. Danny: Then you say it like it’s not your thighs chafing as well, and that’s ruining the material as well. Sam: The quote here is that it’s really about the rubbing through the thighs, and how much pressure is there as opposed to there might be something wrong with our fabric and we’re going to look into it. Sam: Even if you never do anything about it at least acknowledge. So this is another really crazy one and he never came back and never made any kind of apology. Sam: So, what’s the impact? Lululemon is still there. They’re still selling. What kind of an impact does this really have if you don’t come out and make these massive heartfelt apologies? Danny: Well, you know they did take a big hit. Cause I was at a social media conference when this came out and it was one of the big talking points out the statement or lack of statement. So I know that they did take a big hit all of a sudden on social which is why we pulled it up there. I’m pretty sure they took a big hit financially as previous customers who were once size zero with a pair of sculpted thighs or whatever, stopped buying their products and returned products or whatever. Danny: And I mean, as well, you gotta think about what that means to the employees at Lululemon who aren’t the ideal size that this guy is on about. You know, how does that make them feel if I’m a plus size woman or guy working at this company where my boss is essentially saying well you know, you’re too fat to wear my products. Sam: Yeah, well for myself and on behalf of all of the viewers who are following us on the blog, I want to thank you for not wearing your Lululemon yoga pants today. I’ve seen you in them and it is not a pretty sight. And you know what, they almost seem to have doubled down. Sam: Instead of actually making some kind of an active apology.. There’s this one great tweet from a woman, Diana Russell, who saw one of their stores and on the window it said, their tagline for this campaign was: Love, cups of chai, apple pies, rubbing thighs. Sam: Right, so they’re trying to be irreverent, maybe, you know what I mean, just trying to be comical in their response because of all the negativity around that rubbing thighs. They actually doubled down to use a popular term today on the political front on this. Or tripling down as the case may be here. And that obviously didn’t go over well. Sam: I know that within my family and friends, the women that do buy these, stopped buying them. Because if I’m going to be spending that kind of money, and they started looking for alternatives and they found alternatives that they’re happy with and they haven’t gone back. I don’t know that the bigger impact financially is there or not. But certainly this is going back a year now, we’re still talking about this. So that negativity doesn’t seem to want to go away because they never did anything to really counter it. Sam: And the one ad that they put out, the title was, how this woman lost 44 pounds without any exercise. Right. And that’s of course, who’s not going to want to see that? Sam: I’m on a weight-loss thing right now, I’m exercising with my trainer so I would have clicked on something like that if that was about guys. I don’t have to kill myself in the gym to lose 44 pounds? I’ll take a look at that. But of course, when you read the story, it’s actually about a woman who lost 44 pounds because she was suffering with a rare form of cancer. So that’s the reason that she lost 44 pounds without dieting because she was sick. So a combination of her being sick and the medication she was taking. Sam: And of course, what they said, there was a backlash on social media, people started complaining. And what they did, they just changed the title, to how this woman lost 44 pounds by loving her body. Or something like that, and taking care of herself. As opposed to just getting rid of it altogether and making an apology that we were insensitive and this was click bait, own it! Sam: How important is that owning? Because they never actually apologized. They just changed the title and went forward. Danny: Well part of me also thinks how effective was the new title? You know, was it as sympathetic? Like loving your body, I’ve never had cancer I know people that suffer from cancer and theres days when you hate your body because you’re going through treatment. So you’re thinking is that new title any better? Danny: But the fact that they made it a click bait article in the first place is unforgivable. And to not own it in any shape or form afterward. You know, let’s say Cosmo comes into and this does them no favors, especially when more and more magazines are going under. As people migrate to pay walls and you know, the telegraph, they’re doing well with the pay wall. Danny: So folks like, you know you’ve got Chatelaine, they’re doing excellent stuff with their content online. Put that against Cosmo, then that’s stuff like that. Danny: As recommended by me! Sam: As recommended by, you know, the woman himself Danny Brown as opposed to Danielle, on the weekends, when you get dressed up. Sam: So now I got the thought of you in yoga pants and you in drag now in my head. Sam: This is why we drink. Danny: I chose. I’m just going to go home now! Sam: Alright, so moving right along. Another one. Sam: Topman Tailors, which is now here in North America but they’re a British fashion company, I think they’re part of the Bay in Canada now. They forgot the golden rule of marketing which, you know, I think we learned on day one of marketing class in university, which is: never insult your customer. I mean I guess unless that’s your brand. And soup nazi from the good old Seinfeld episode, you know insult your customers and they’re going to want to keep coming back. Sam: Maybe that’s the strategy they have here but clearly it’s not working. In the UK, a number of years ago they put up, they were interviewed basically, and in that interview they said that the person who directs their fashion line in that article, he called his customers: football hooligans, and football again that is soccer for you Americans, football hooligans and beer swilling lads. So that’s how he classified the audience that buys product at Topman shops. Sam: And you know, everybody, of course, lost their minds and said what are you talking about? Why are you calling your customers this? Sam: And the way they apologized for it, or the way that they went and explained what they were doing is well, you know, this guy who directs our brand, he lives the brand. And he’s a partier. Basically what they said. Danny: So he’s a hooligan. Sam: Basically, yeah, that’s what it comes down to. Alright, well he goes to pubs, he lives large, he parties hard, he sees what the average guy today is wearing. They don’t wear suits. And at one point he says, you know, they don’t wear suits when they’re being arrested. But they want to wear something nice just the same and that’s who I’m appealing to. So basically they said the head of our fashion brand is a hooligan himself and everybody else is so guess what, we’re going to target them. Sam: Which in a way I give them credit for their honesty. Right. Can you really blame them though for being honest? And say, look, there’s a population of people that live like this. That are soccer hooligans, or you know, football hooligans, that are beer swilling lads and like to stay out late and party and womanize and fight and we want to dress them. Why is that wrong? Danny: I think it’s probably.. I remember Topman, I used to buy from Topman back in the UK and it kinda reminds me of another example. Sam: Do they sell yoga pants? Danny: Uh, no. That was their downfall which is why they expanded themselves in North America. It reminds me of another company called Ratner’s which was a UK jewelers back in the 70s and 80s. Huge company. They sold like $1 $10 pieces of jewelry or whatever. And at a private dinner event the CEO mentioned that, you know, we could sell these to anybody, they’re pieces of crap and it got it. And there was huge backlash and then the company actually folded a year later. They went bankrupt. Danny: But, back to this comment here. I think it’s the wrong people that maybe got picked up on the complaints, etc. because the audience is the football guy, the hooligan, the fat lab innit. And they probably enjoyed being told yeah, we’re going to dress you, we’re making clothes for you. We don’t care about people that want $100 shirts or whatever. Danny: It’s the marketers and maybe folks like us, I guess, that are looking at this and thinking, well wasn’t really sure there was a bigger issue than was given. So I think they actually got their audience and their target message in right and we just, like we generic tend to pick up on crap that we complain about. Sam: Yeah, well like I said our favorite thing to do is to criticize other people’s marketing campaigns. So, but I mean it’s a good point and there’s a lot of that right now especially with all the boycotts. Right, I know that there’s companies who are marketing specifically for the purpose of getting the others to boycott and then boycotting the boycott. Right, so taking aside and owning that. So I don’t know if that’s necessarily a faux pas on their part but they owned it and it became part of the brand ethos and they’re expanding so who’s to say it’s a faux pas. Danny: It’ll be interesting to revisit that one in about a year or so. Sam: And see how that worked. Well Anna’s giving me the, we’re done, we’re done. I know, we forgot the bell. Danny: We forgot the bell! Sam: In the whole move from our last office to this office I’m not even sure where that bell is. Sorry Steven, I will find that bell. [bell dings] There you go. Sam: Quick one. Alright so last call. What is your takeaway that you want to leave everyone with. Danny: I think it’s fill the old verse that you understand your audience and don’t piss them off. Understand what you’re trying to say to them and you own it whether it’s good or bad and you say, you know what, like the last example did. These are what I’m going after, I’m actually going to stick to that. And stick to your guns throughout a company. Danny: That’s a big word, yeah. Sam: That was on my word of the day calender. You know, the more egregious that faux pas is or the more people feel slighted by that the more you need to then really take definitive action beyond just the apology to sort of let it die down and then people are going to be talking about what you did as opposed to make it up as opposed to the faux pas. Sam: Anyway, that’s it for today’s episode thank you very much, we’re at our time. It was good. Danny, decent beer? It’s growing on me. Danny: Yup. Make sure you hit the subscribe button on YouTube, whatever that is down below. The little notification bell, out there somewhere, and you know you can find us on about 10 or 12 podcast platforms as well. Sam: Perfect. Thank you very much. Thank you Anna for stepping in today. Cheers everybody.